The 40.2 metre motor yacht Petrus II has been jointly listed for sale with James Rayner at Camper & Nicholsons and Inigo Nicholson Yachts. Built in GRP by Italian yard Benetti to a design by Stefano Righini, she was delivered in 2012 as the first in the yard’s Benetti Classic Supreme series and has since had just one owner. The interior, by Francois Zuretti, uses natural oak and wengè woods, enriched with handmade leather inserts, to accommodate 10 guests in five cabins. The main deck master suite is full beam and has a sea balcony to port while two doubles and two twins are located below deck, all with entertainment centres, LCD television screens and en suite bathroom facilities. The main deck saloon comes with floor to ceiling windows, comfortable seating and an entertainment centre including a 50 inch LED television screen while forward is a dining area with seating for 10 guests. Accessed through double stainless steel and glass doors, the aft deck has seating and tables for entertaining and dining in the fresh air. The sky lounge is ideal for relaxing on free standing settees in front of an entertainment centre featuring a 50 inch LED television and there is also a games table that doubles as a small dining table for casual snacks. The sun deck of this yacht for sale is in a class of its own and offers a bar, Jacuzzi tub, sofas, a barbecue and an al fresco dining area shaded by a fixed Bimini top. 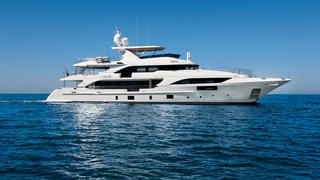 Twin 1,450hp MTU diesel engines give her a cruising speed of 14 knots and a range of 3,500 nautical miles at 11 knots. As would be expected, she is fitted with Naiad zero speed stabilizers. Lying in Florida, Petrus II is asking €14 million.